Due to our involvement in the self build market we can offer the following items for hire. 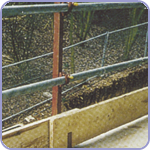 We hire and sell Shorguard guard rail systems. 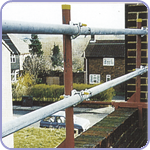 The temporary system SG1 shown is a cost-effective edge protection solution using standard scaffold tubes and boards to complete a robust system. Can cater for slab thicknesses up to 500mm deep. Guardrails are located at the correct height. Toe board location with provision for overlap. Can be used with brick guard mesh to form a barrier for falling materials. M16 hole in top clamping plate to facilitate additional fixing as necessary. Simple to install without needing specialist skills. More flexible than other fixed panel systems. 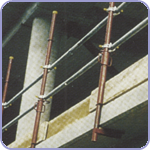 Ideal for new builds, bridge decks, slab decks, steel frames, house stairwells.